Have you noticed how robots are becoming more and more a part of our lives? From practical robots to novelty robots, industrial applications to science fiction, robots are a part of our modern life. This course was designed to give students an introduction to what a robot is and how robots sense the world around us. This is the perfect introduction to the exciting field of robotics because it offers a hands on experience for students as they build and experiment with different robots. For example, students will be able to build a robot that “sees” in the dark or a robot that can sense a puddle of water all while learning about electronics and robotics. 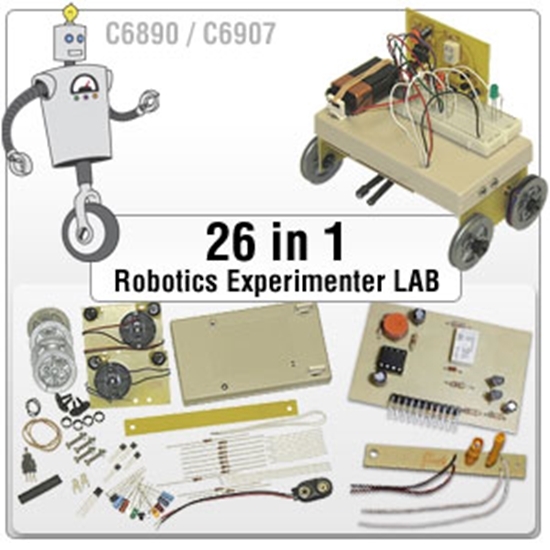 A complete list of the robots included with this lab is shown below. 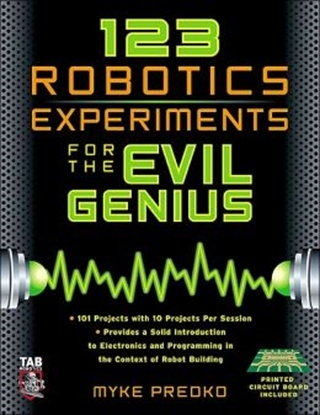 A detailed Instruction Manual is included with this Lab that contains all of the information that students will need to successfully complete the robot experiments. This lab features a detailed introduction what a robot is and what robots do. After the introduction, the student will begin to build a basic robotic platform from which all of the other experiments will be based. The robots progress in complexity and each robot is fun to build and operate. Some of the topics covered include: Sensor Technology, Infrared (IR) Vision, Transistor Operation, Integrated Circuits, Relay Operation, Electronic Motors and basic electronic concepts including Ohm’s law and component identification. This lab is completely reusable and designed with the student in mind. Each experiment has been thoroughly tested and developed to offer the maximum educational value. Each robot that the student will build comes with detailed instructions, illustrations, schematic, wiring guide and theory of operation. All experiments/robots operate on one 9V battery (not included) and use the same robot chassis and relay control board. The relay control board requires soldering for assembly. All of the necessary components and wire is supplied along with a reusable solderless breadboard and detailed instruction manual. 2. Or you can call us at (800) 321-2155 and ask for product 02-615. This powerfull 26 in 1 lab course was designed and built by Chaney Electronics.